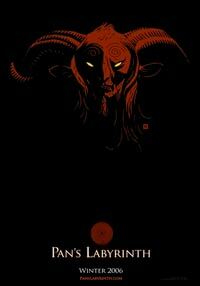 Del Toro returns to his roots originally kick-started with his great take on the vampire myth with his debut Cronos. His commercial efforts like Mimic, Blade II, and Hellboy no doubt have an edge over your normal Hollywood action fare. As with Cronos, Pan’s Labyrinth is in Spanish, distancing it even further from the viewer’s expectations (and indirectly aiding in its believability). The only downside to this would be that slow subtitle readers could perhaps miss a few glimpses of the amazing images. 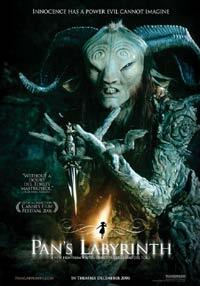 Furthermore Del Toro also revisits a previous time period he explored in The Devil’s Backbone - Set during the Spanish civil war, the tale of Pan’s Labyrinth is told through the eyes of a young girl (Ofelia) whose mother has married a coldhearted captain on the heels of ill-equipped rebels in the countryside. Her mother is pregnant with her stepbrother. They are sent for and brought into this dangerous environment because “the mother of the new child should be where the father finds himself”, whatever the circumstances. Within this tense situation Ofelia is systematically swept into a fairytale world where she happens to be the daughter of the underworld king – she wandered off to the world above, one day to return unknowingly in the body of another. Adjacent to the old mill taken over by the Spanish army under her stepfather’s command, there lies an ancient labyrinth. Here she is met by an awe-inspiring faun who relays her destiny and gives her several tasks to prove she is the chosen one. This fantasy world is contrasted by the escalating conflict in the hills. With creatures ranging from fairies to totally creepy monsters (the biggest one in fact being the captain), Del Toro brings to life an amazing world of mysterious fantasy and cold reality. 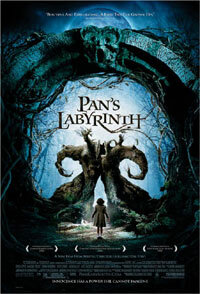 Fantastic in every sense of the word, Pan’s Labyrinth would more than likely not be justified in the hands of anyone other than Del Toro, an exceptionally visual director who does not sacrifice great storytelling for visual effect. With him you’re guaranteed to get both in serious doses. One sad fact about this work of art is that unless this gets a long theatrical run at art cinemas, it is doomed to flicker for a few weeks in a couple of mall theatres and disappear to be rediscovered on DVD where the English dubbing will take preference. While it should’ve won the Best Film or Best Foreign category, it did deservedly win the Best Cinematography Oscar™.